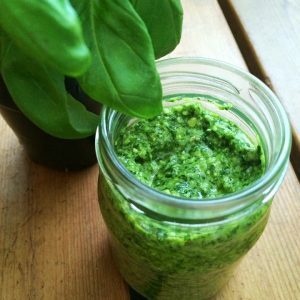 Pesto is such a versatile condiment that can be incorporated into so many different dishes – dip with hommus and veggie sticks, pasta stir through sauce, top roasted veggies or grilled protein, add to breakfast eggs …. so many options. It’s also really easy to adapt this recipe to suit your dietary needs and tastes. Add all ingredients (excluding oil) into a high powered blender, pulse on high 3-6 times to gently combine everything. Slowly add the oil and continue to blend until you reach your desired consistency. If too thick add a little more oil or water. Hint – this will last well in the fridge for up to 1 week. Make sure it’s tightly sealed in a jar with a layer of oil over the top to prevent spoilage. Otherwise freeze leftovers in ice cube trays ready to add to soup bases or sauces as needed.